After a year-long review of studies regarding bisphenol-A, Massachusetts warned parents to avoid storing breastmilk or formula in containers that contain the endocrine disruptor. Officials also urged pregnant and breastfeeding women to also avoid food contact materials made with the chemical. We are concerned about this enough that we want to warn the public. It just seemed it wouldn’t be appropriate for us to sit back and not do anything. The FDA has yet to change their policy on the chemical in food contact materials. Instead, there has been enough demand from consumers that BPA has been removed from many brands of baby bottles and sippy cups. Also, some states and municipalities have banned BPA, so it’d be pretty tough for manufacturers to regionally offer products with different chemical compositions. Last year, Health Canada added bisphenol-A to its “toxic” list, kicking it from food materials for children 18 months and under. 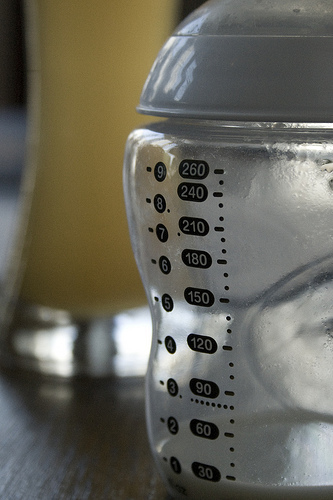 Suffolk County, NY banned polycarbonate baby bottles, made with BPA, from its jurisdiction this spring. Minnesota became the first state to ban bisphenol-A when it legislated the chemical out of children’s drink containers in May. In a move the Chicago Tribune called “largely symbolic”, the Windy City banned BPA. That slightly cynical quote was referring to the fact that many infant and toddler food contact materials are already being made without BPA because of other bans. Even financial investors are questioning the safety of the chemical and have recently turned to the FDA for answers. Now with these bans and the Massachusetts warning, what’s a chemical company to do? The only logical thing: plan a public campaign that touts the safety of bisphenol-A with a healthy pregnant woman as its star. Again, bisphenol-A is an endocrine disruptor that has been linked to lower sperm count, early onset of puberty, breast cancer, and obesity. Ninety-five percent of American adults have detectable levels of BPA. Image: gregoryjameswalsh on Flickr under a Creative Commons License. Join Daniel Goleman Goleman as he talks strategy with leading thinkers through the life cycle of Ecological Intelligence – from its roots in the deep interconnection of human and planetary health, to our emerging power as consumers to know and guide the ecological impact of corporate practice, to the business leaders that will evolve their practices to prosper and flourish in this new, radically transparent climate. Join the dialogue. Great job Massachusetts! I am so glad companies are getting smart and taking this out of their products! It is so scary that some companies are trying to keep BPA in their products…why is making more money better than developing a product? So frustrating!! !